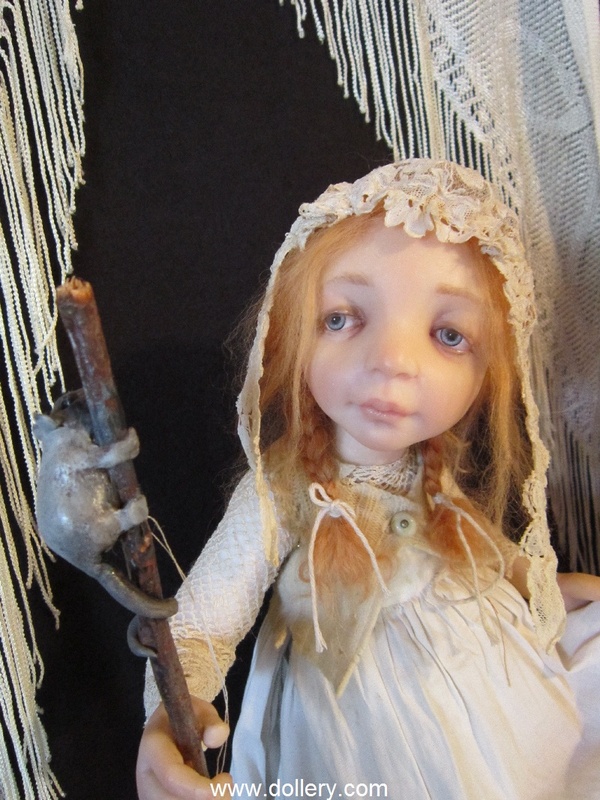 2012 - New dolls available below! 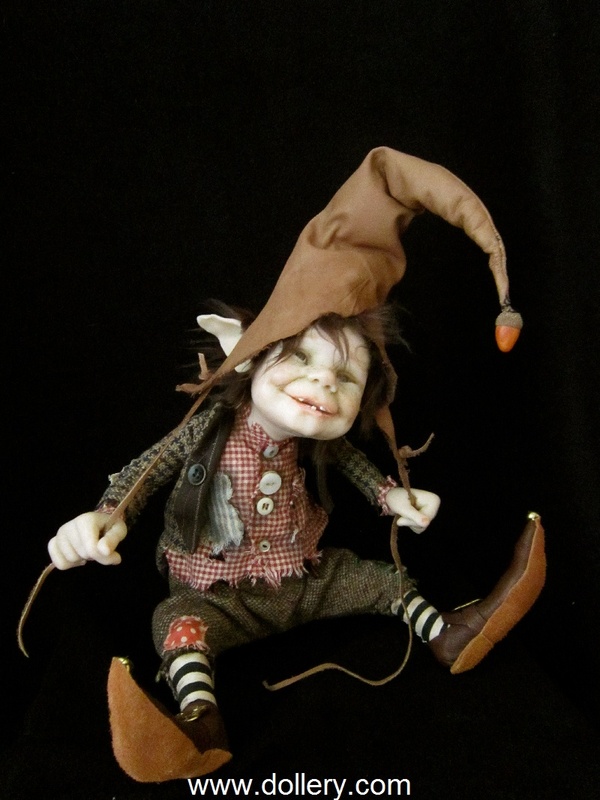 Lulu also does Elves, Leprechauns, and Gypsies! Let us know if you are interested. Contact kmalone@dollery.com or call! 2009- Lulu continues to amaze us with her great selection of bears! "Theda" is just wonderful. 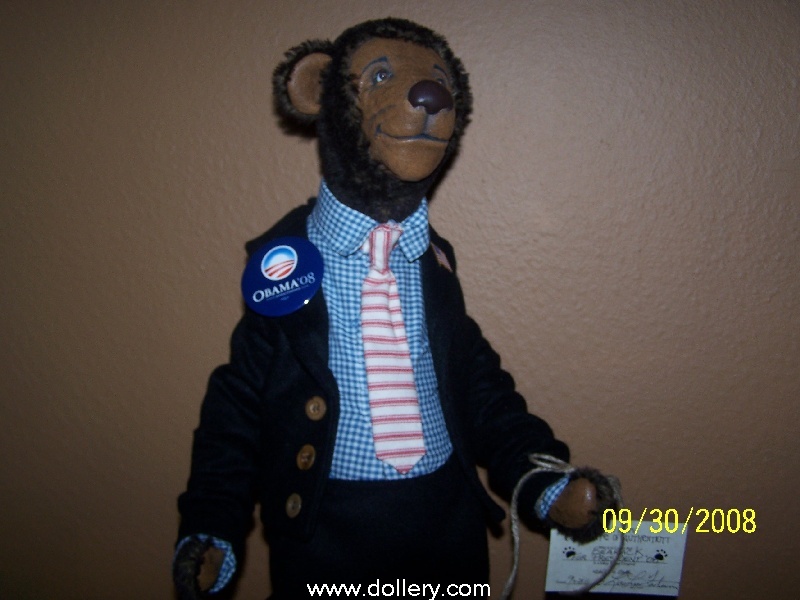 Also - the "Obama" bear has been a big hit. We have carried Lulu's work for many many years. She is known to capture a moment in time. 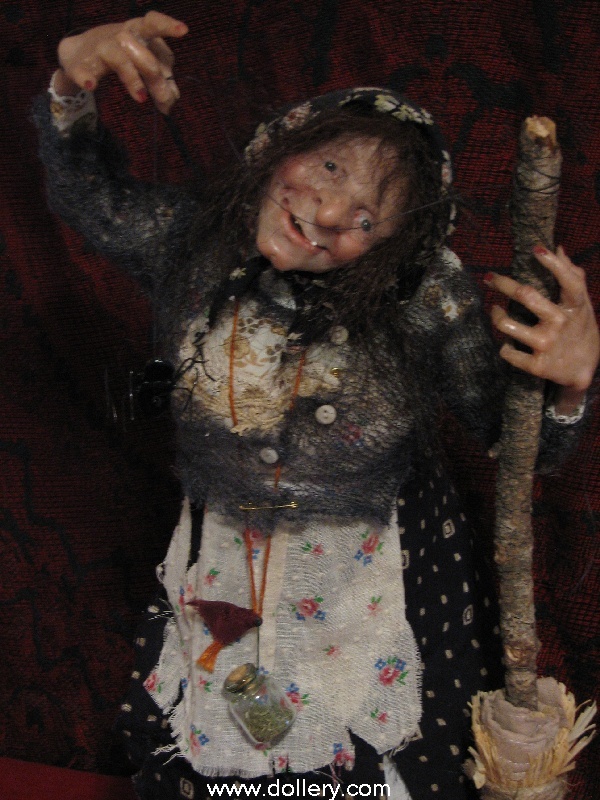 She was well known for her ooak cernit dolls done in vintage clothing and her small limited editions resins in ooak costuming for many years. Lulu attended many of our earlier shows. 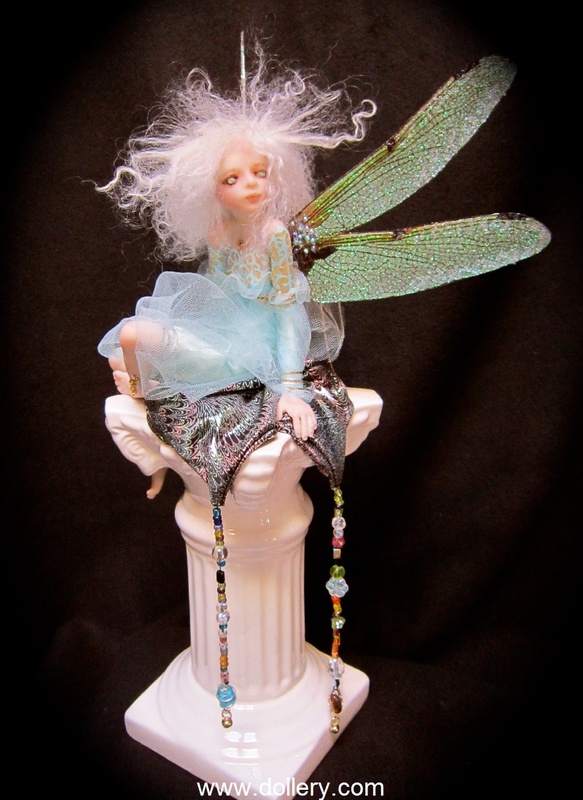 Currently she still makes a wide variety of ooak work (you can see some recent work below). 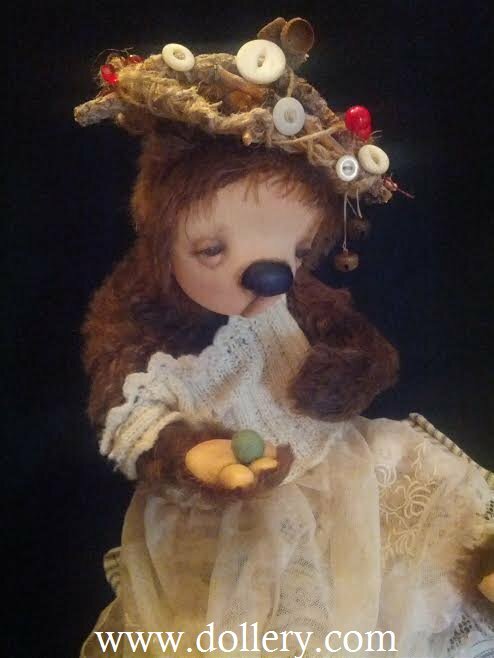 If you are interested in a custom bear done previously from earlier years let us know and we will be happy to check availability for you. 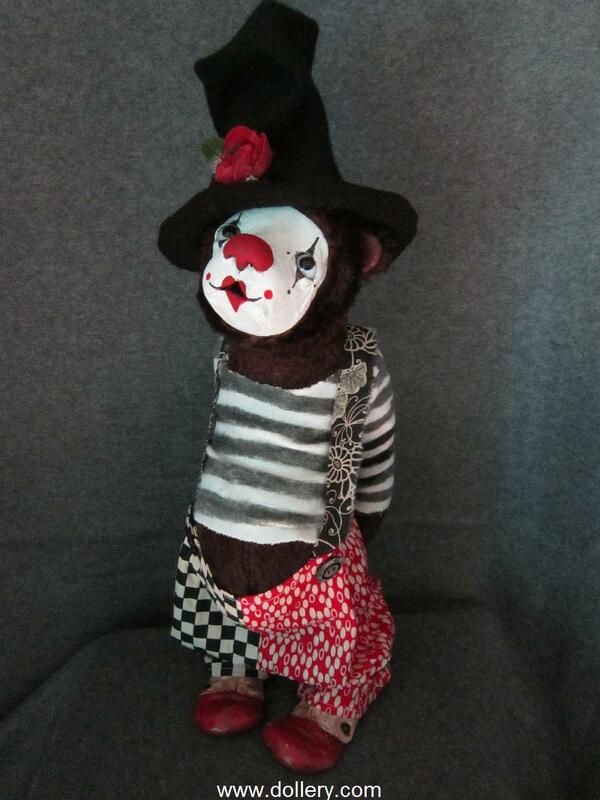 Lulu will also do custom ooak pieces similar to others but not exact. 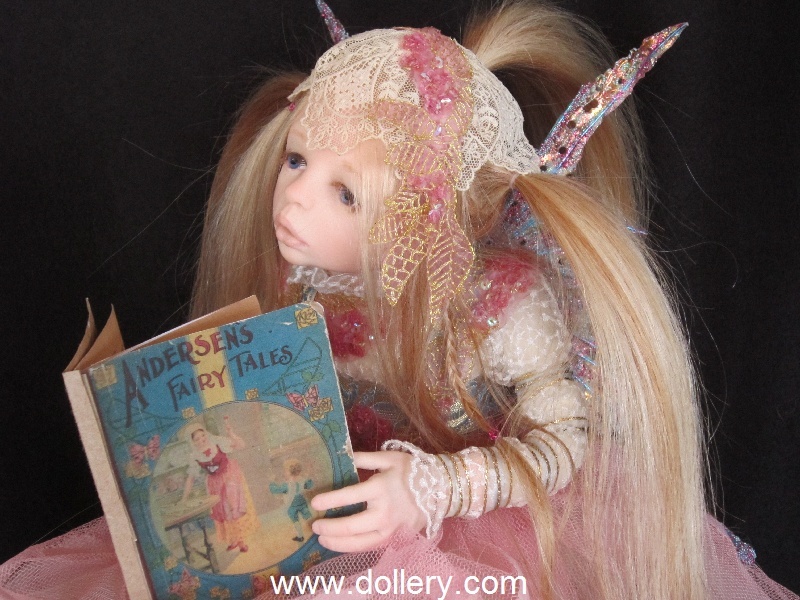 Also - if you are looking for a specific doll in a ooak theme that is no longer available email kmalone@dollery.com about a possible custom order. 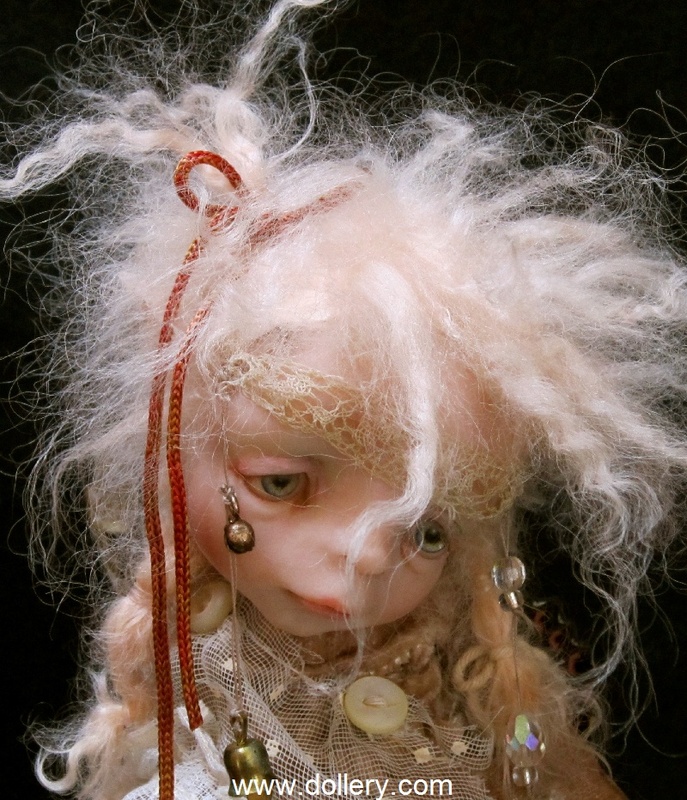 Lulu no longer does her resin editions. 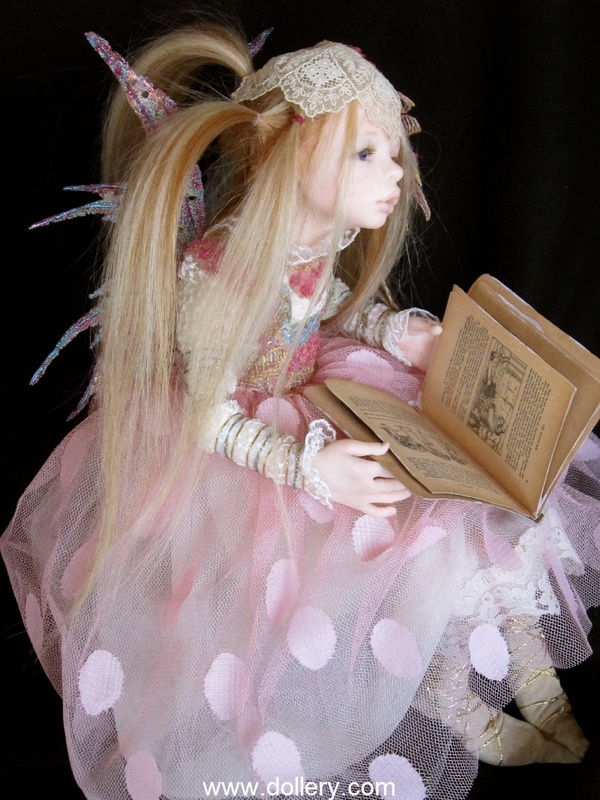 She is strictly focused currently on her ooak dolls and ltd. bears. 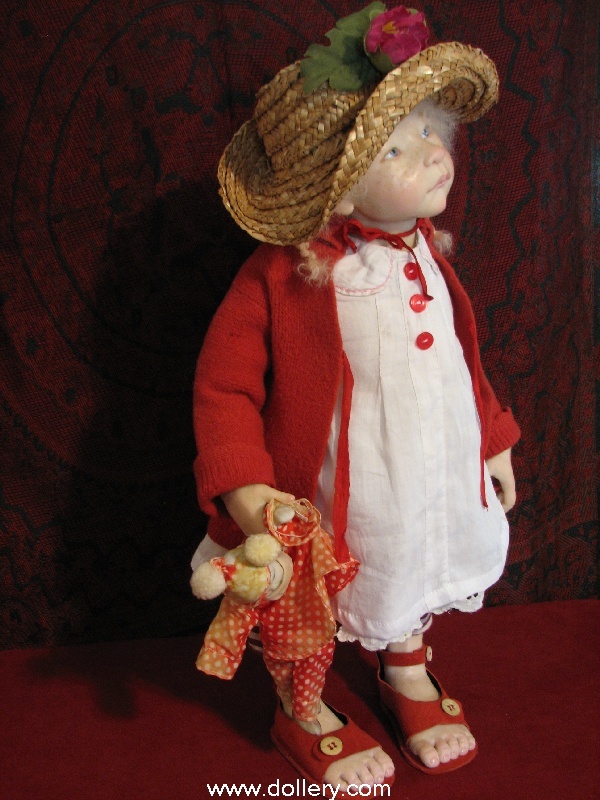 As it has quite some time since these dolls and bears have sold, all prices have gone up. 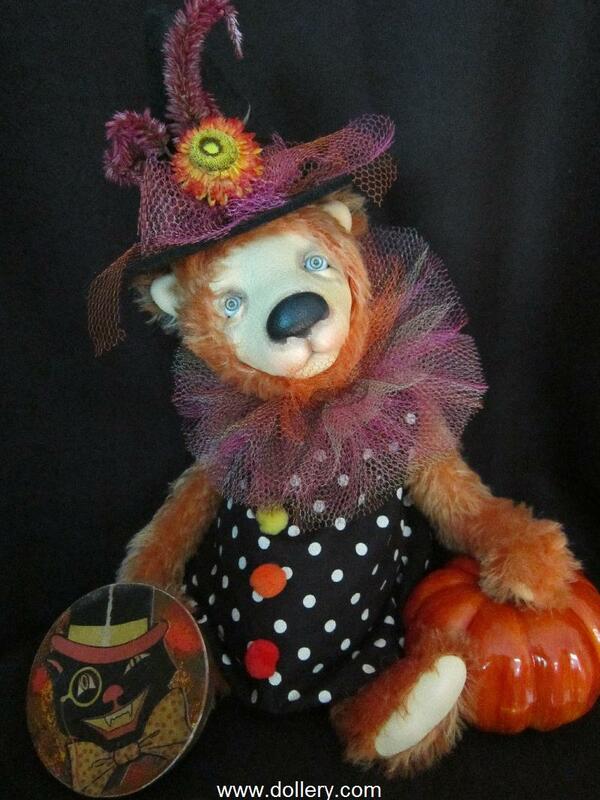 We can still order from Lulu but for example the Cracker Jack Large bear is now at $800. All other pieces will also have price increases. Thank you for understanding. 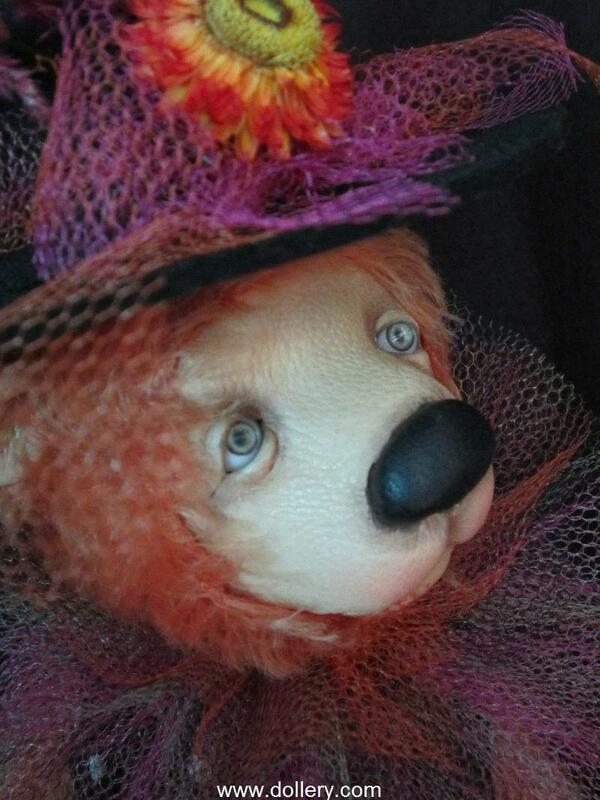 She's a OOAK leather and mohair sculpt. Her eyes are brown glass. 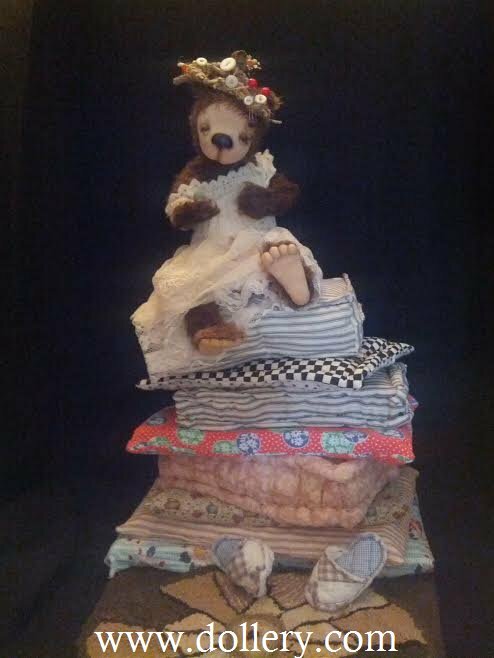 Lulu made all of her costume with antiques and vintage fabrics, including her slippers made out of an old quilt. 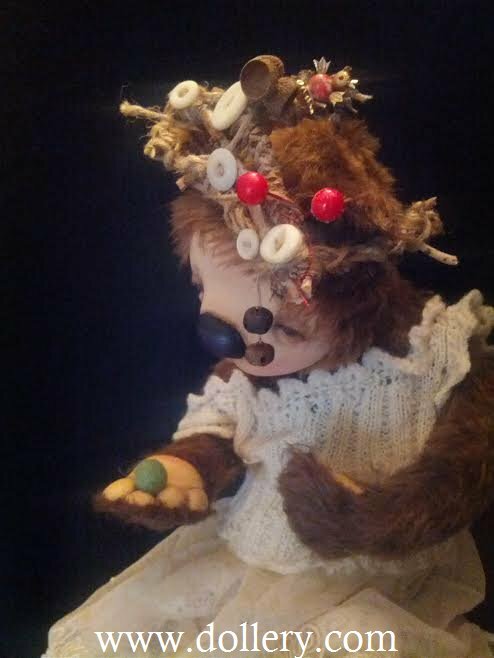 She needle felted her green pea, and made her Tiara out of twigs, antique buttons, rusty bells, acorns, and old pieces of costumes jewelry. 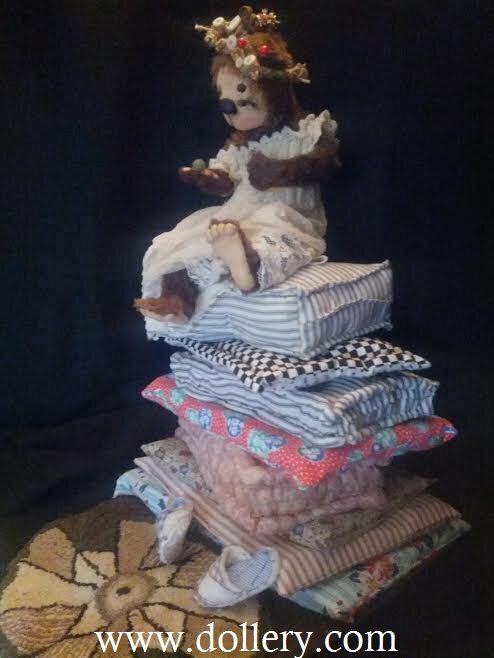 Her mattresses have a wooden dowel placed through the center, and connected to a wooden covered platform so the bear sits safely on the top. See something you like but it is sold? Consider doing a Custom Order. Each is a one of a kind but similar themes or looks can be achieved. Different hair, eye and costume colors of your choice! 25% down and then you can either make monthly payments or pay the balance when the piece comes in. You can even request pieces to come in into 2015. 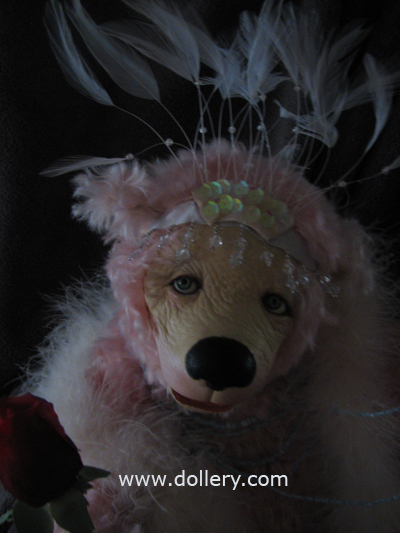 1/K, mohair and leather, paperweight glass eyes. See something you like but it is sold? Consider doing a Custom Order. Each is a one of a kind but similar themes or looks can be achieved. Different hair, eye and costume colors of your choice! 25% down and then you can either make monthly payments or pay the balance when the piece comes in. You can even request pieces to come in into 2013. 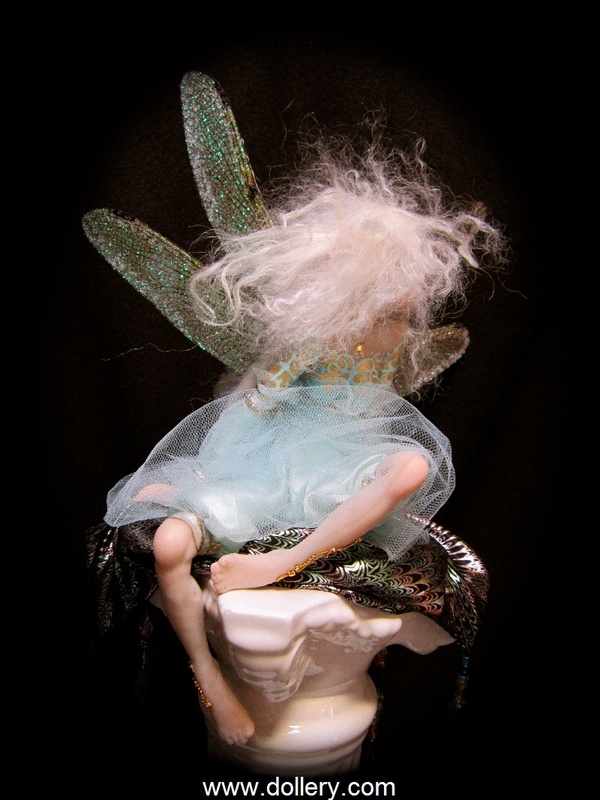 The whole piece is 19"(48cm) from the tip of her wings to the bottom of the pedestal. 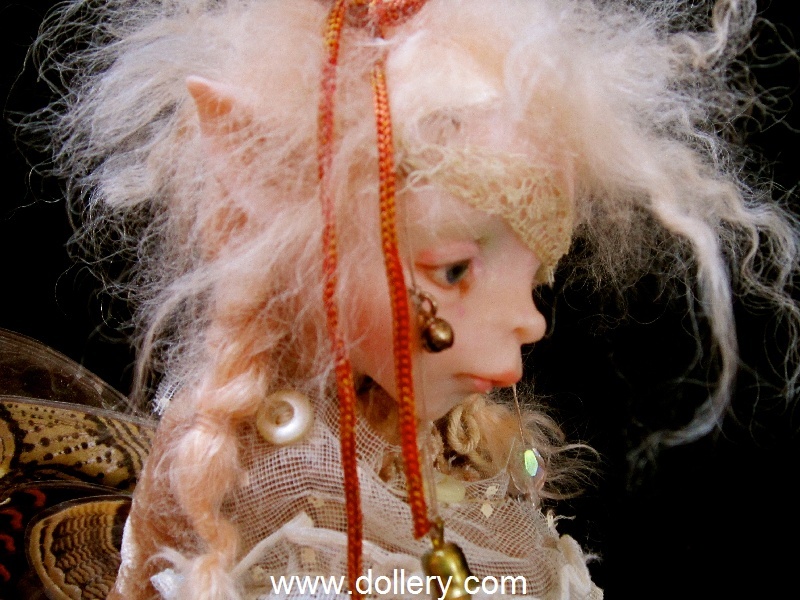 She is OOAK Cernit, full sculpt. Her eyes are hand painted. 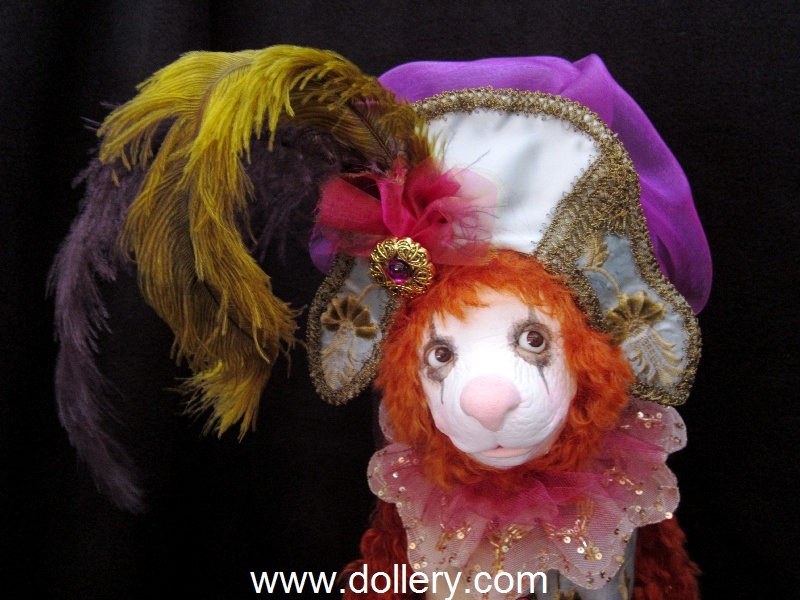 The wig is made out of mohair. 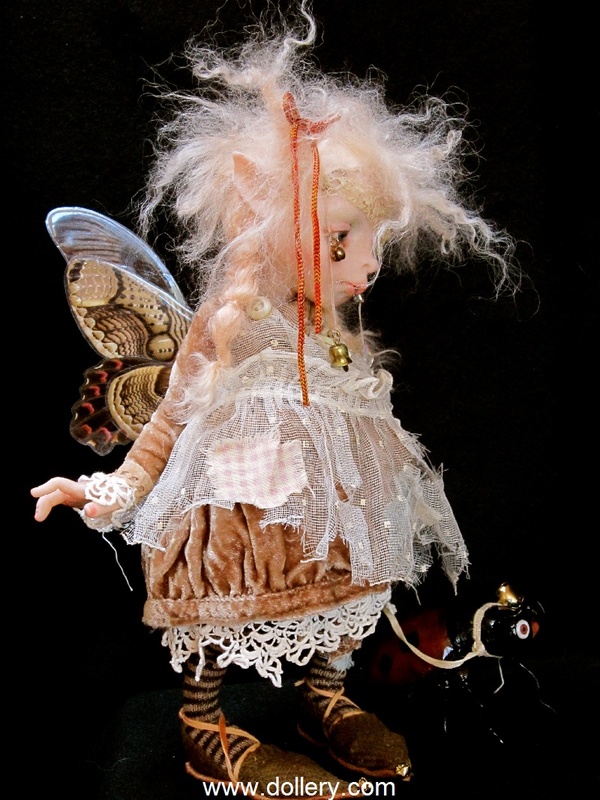 Her Cicada wings are OOAK Artist made. The bodice of her costume is hand painted, and satin, fine netting, and gold and pale blue ribbon make up the rest. Gold accents were used for her ankles, and her neck. 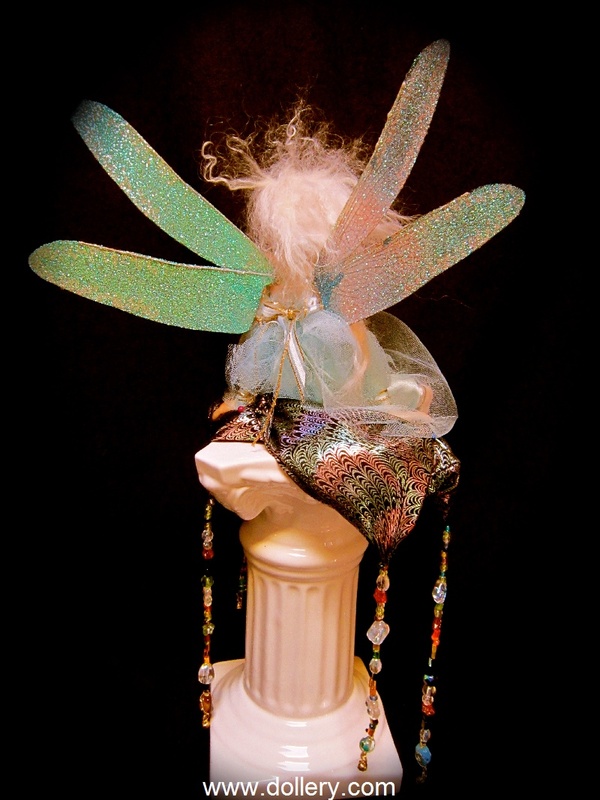 The vintage pedestal is ceramic, and Lulu made the cushion out of shiny fabric that brings the colors from her wings out beautifully. She used different shades of glass beads to hang from the cushion. She is 19" (48.5cm) standing. 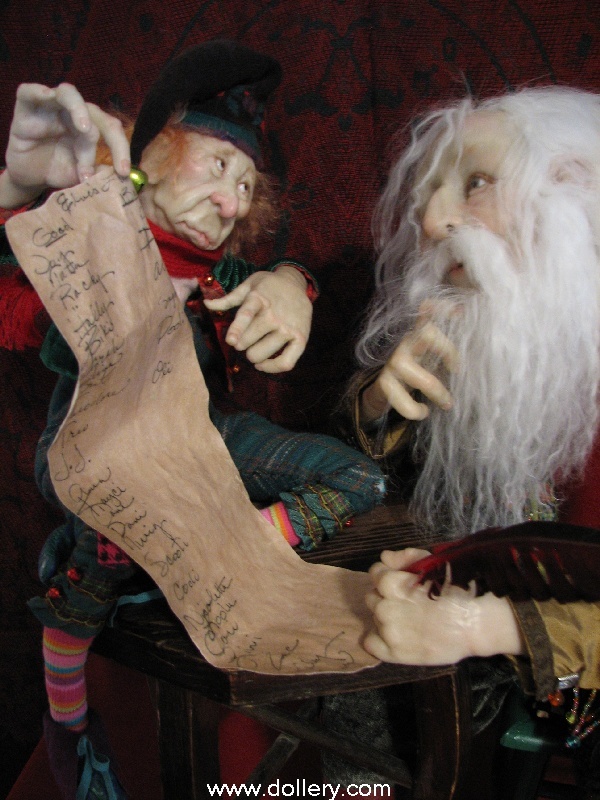 OOAK Cernit and Fimo mix. 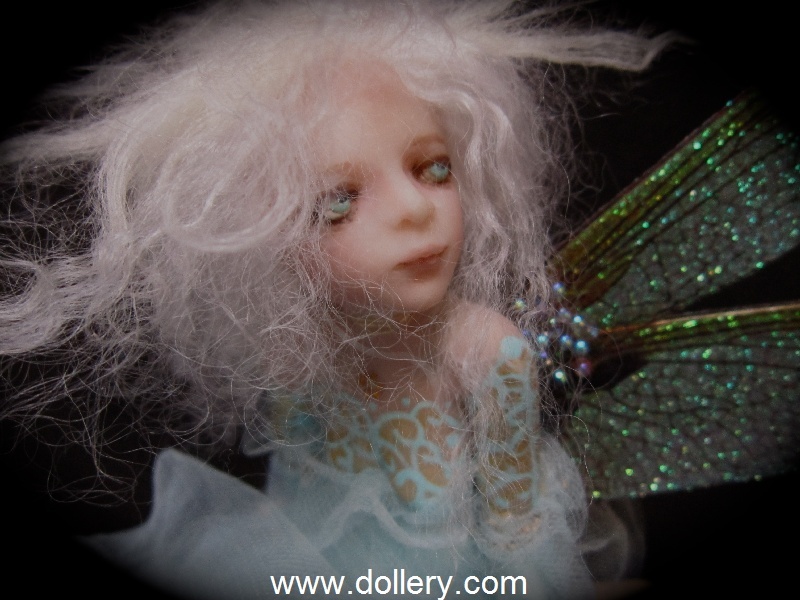 She has PW Glass eyes, and mohair lashes. Lulu made her wig with human hair. Her costume was hand made using vintage and antique fabric, lace and ribbon. 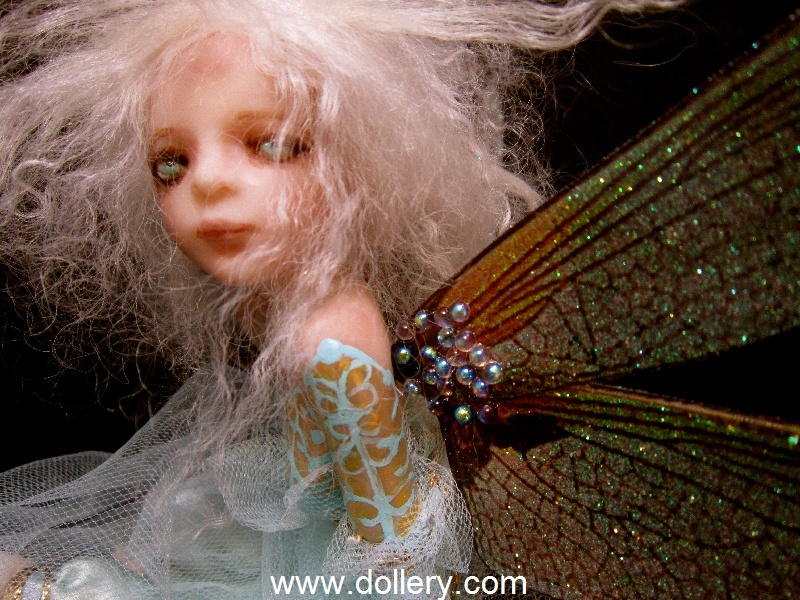 Her wings are OOAK, and ultra fine suede leather used to make her Faerie boots. Lulu also made her small Faerie Book! 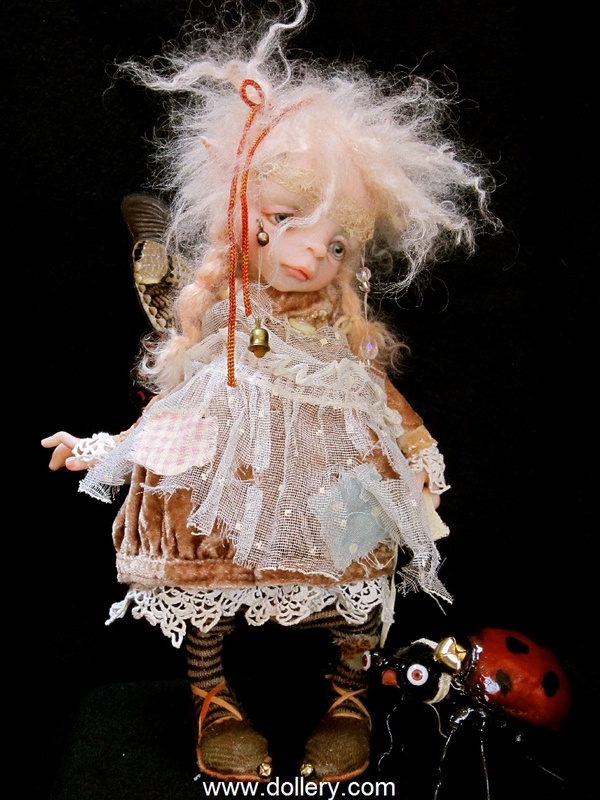 10" (25.5cm) tall OOAK Cernit, Glass eyes, Mohair wig, real Moth Wings, and antique and vintage fabrics for her costume, all totally made by Lulu! 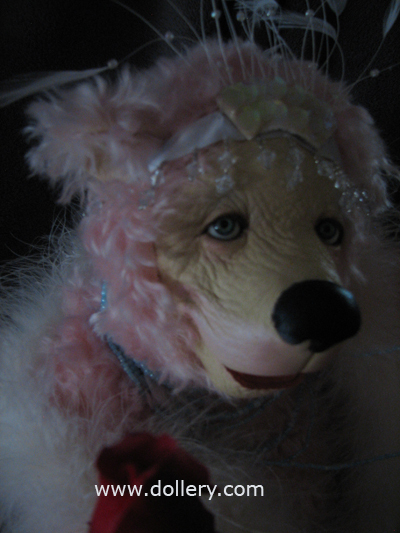 She also sculpted Ladybug, who has artist made eyes. 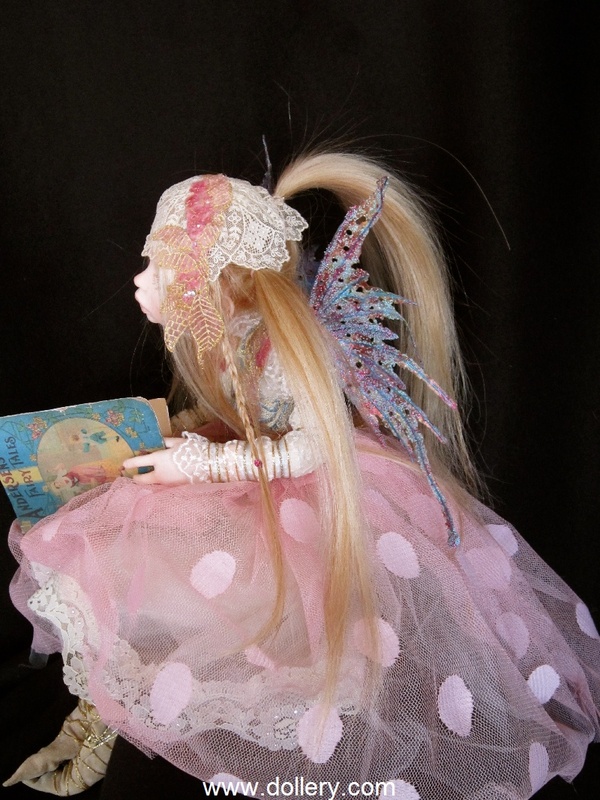 Cinderella is a OOAK Cernit doll, 17" tall. She has beautiful blue eyes, and her wig is made from Tibetan lambs fur. 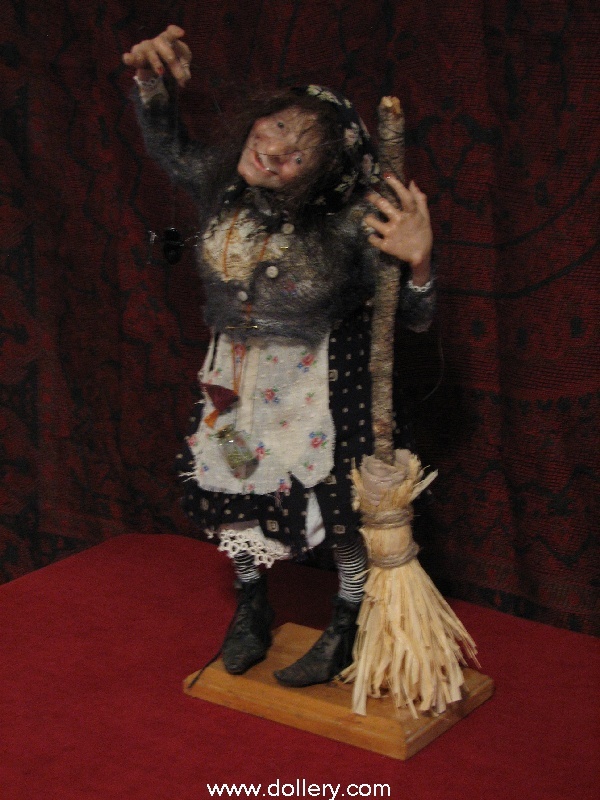 Lulu made her a broom and sculpted 3 little mice who want to help her sew a button back on her knit vest that fell off. 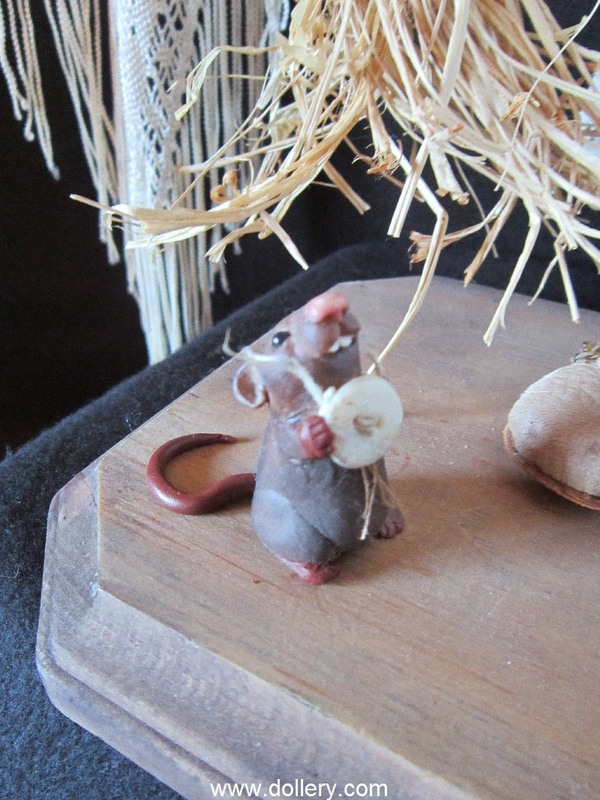 The mouse on the floor is holding the button, the mouse just above the broom straws is holding the thread, and the mouse on the top is holding a tiny needle. 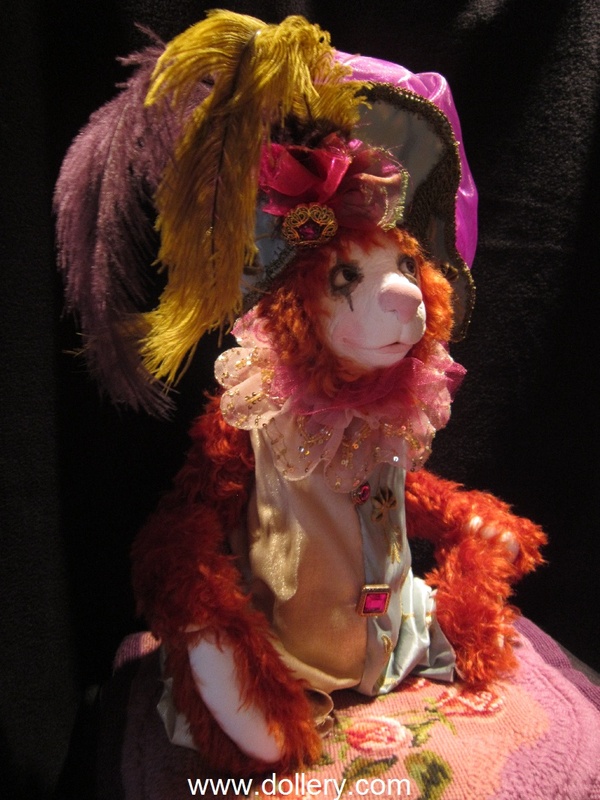 Her costume is made out of very very old antique fabrics and lace. Her shoes our made out of leather, and the beads on them are also antique. Mohair, leather sculpt. He is 13 1/2" (34cm) without his top hat. 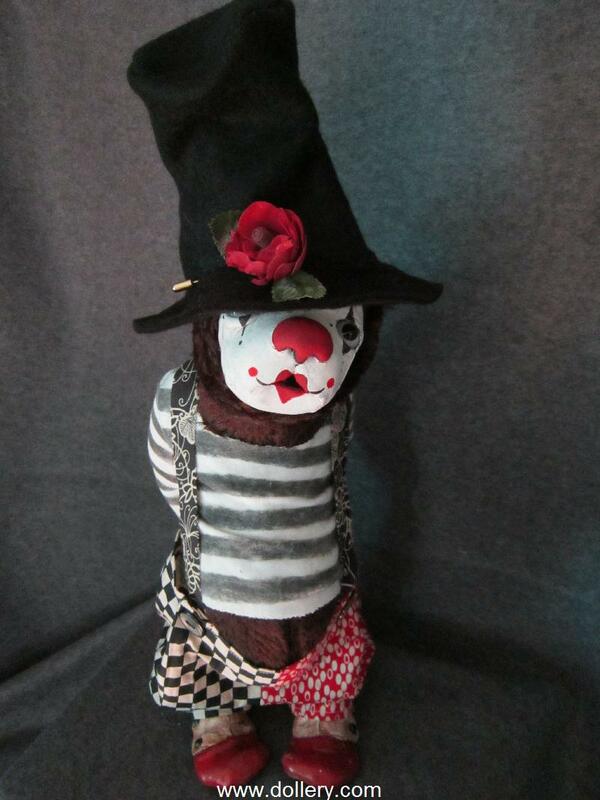 His face is painted leather as Mime. 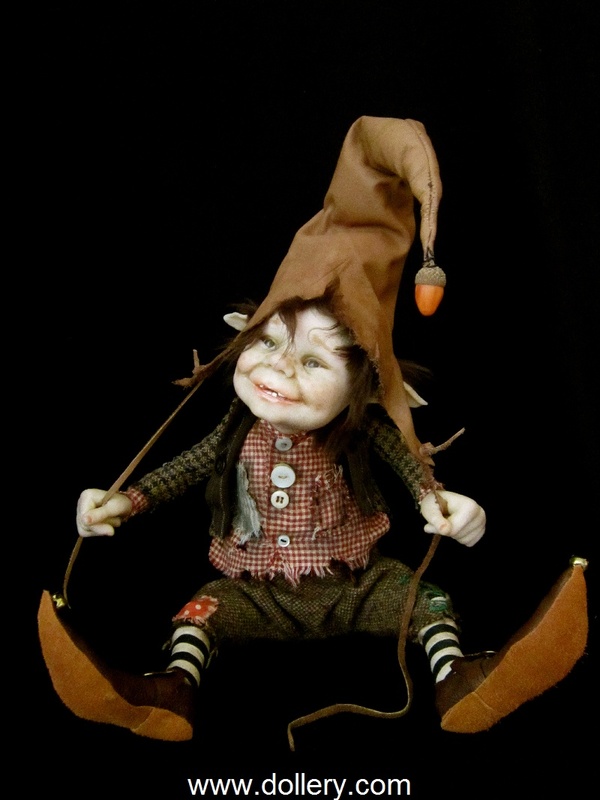 Sculpted shoes which are heavy and enables him to stand very well without a stand. 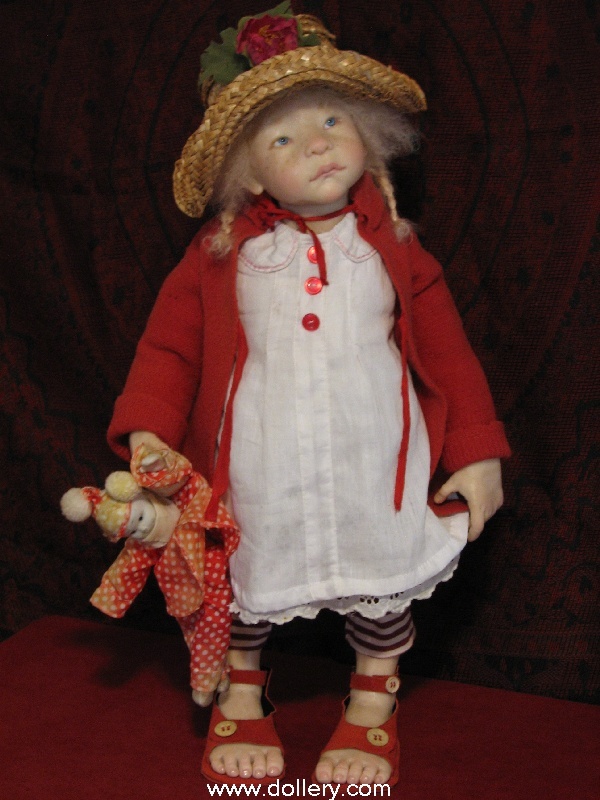 14" (35cm) tall standing without her hat. 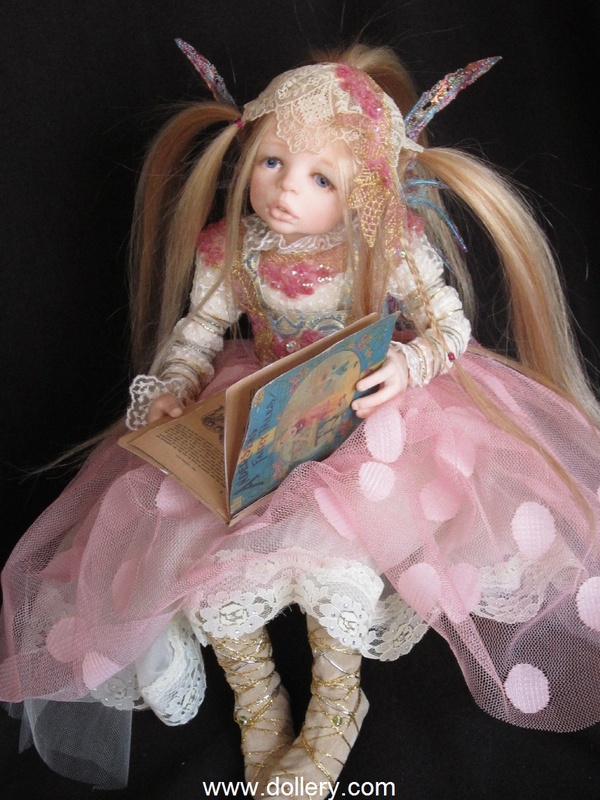 She is about 10 1/2" (27cm) seated. She has a jointed neck so she can turn her head to either side. 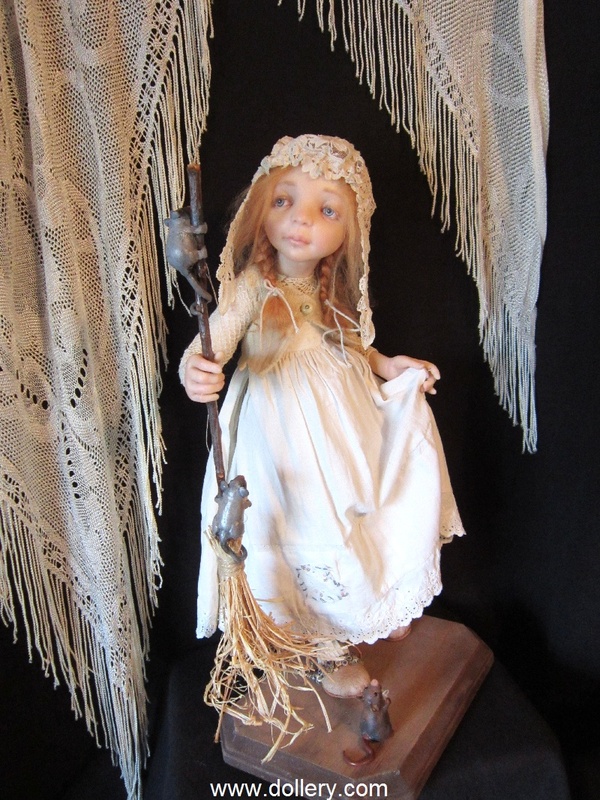 Sadie is ready for the season with her witches hat and dress with lots of netting and very beautiful straw flowers from Lulu's niece's garden. She made her noise-maker even brighter with a vintage Halloween cat. She also has a nice shiny pumpkin! The Orville character has been around for over 15 years. 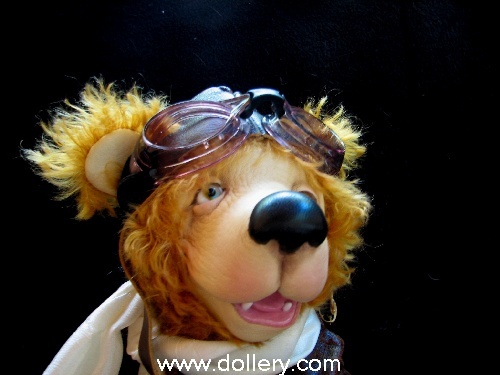 As there are no molds or patterns used each bear is a true one of a kind. 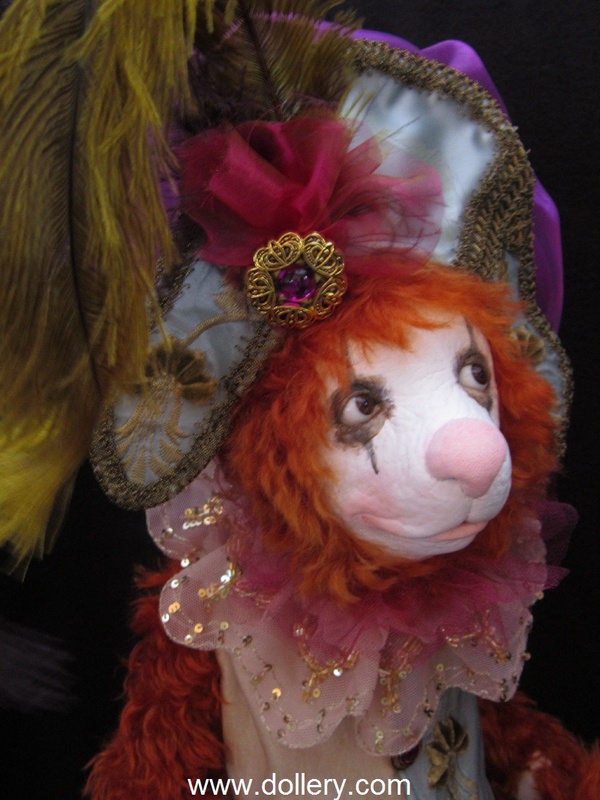 Lulu uses leather, mohair and paperweight glass eyes. Each outfit is custom made to fit each bear. 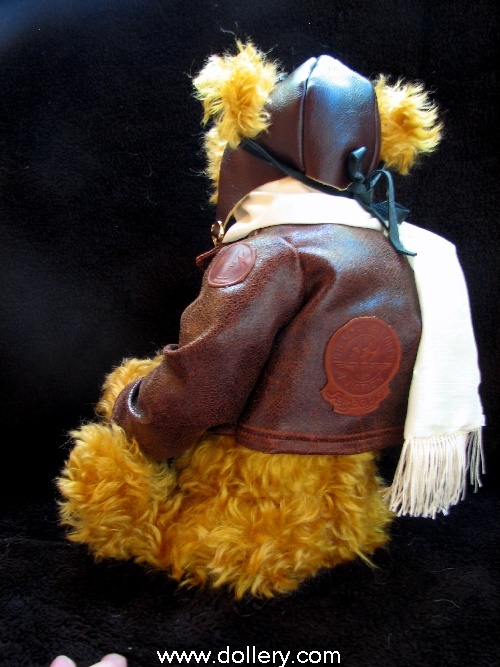 The patch on the back of his worn leather jacket reads "U S Marine Corps, Aviation, Flyboys." The goggles and scarf add just the right touch. 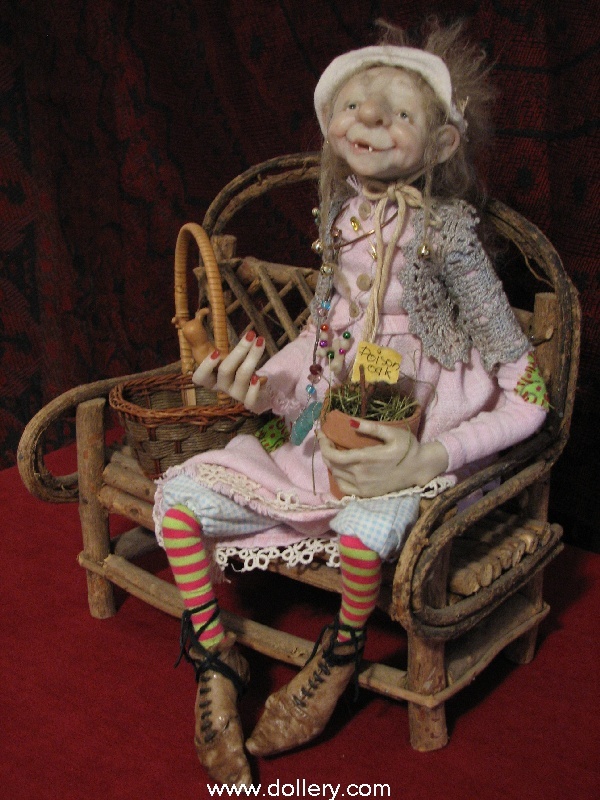 She is a OOAK, 17" tall, jointed, and can sit stand or lay on her left side like a vamp. 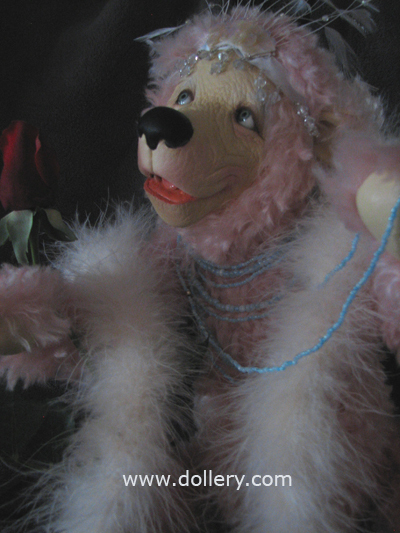 She is made with beautiful mohair, dyed a real pale pink. Her eyes are German blown glass. She is wearing an ivory colored boa, has pale blue glass beads around her neck, and a pale blue satin headband with glass beads. I added a feather piece for the front with opalescent sequins. She has a single red rose. 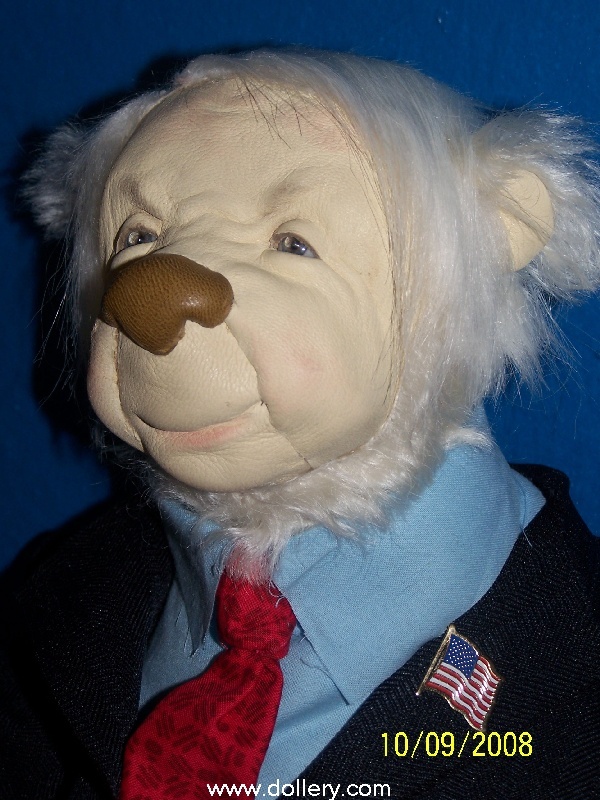 17" tall, Fine mohair, beautiful leather, glass eyes, I made him a wool suit, cotton shirt and tie, a flag lapel pin, and a campaign button. 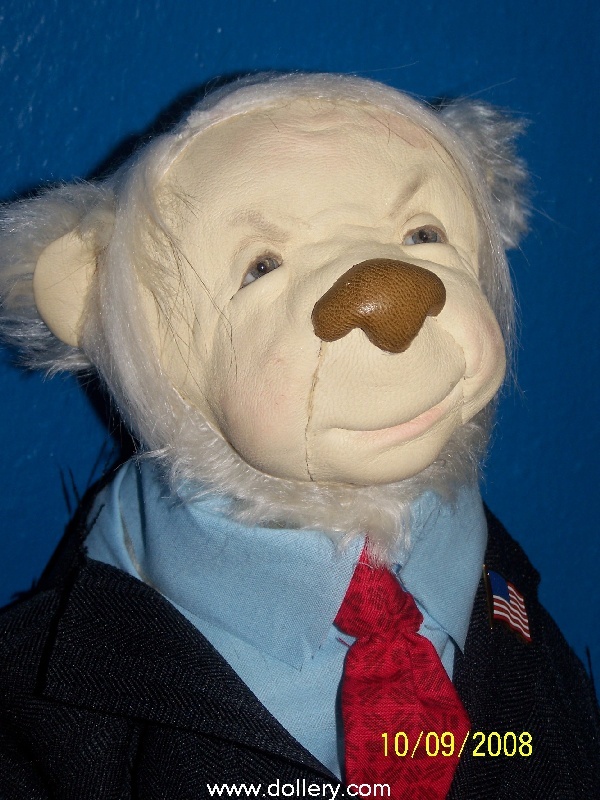 17" tall, Fine mohair, beautiful leather, glass eyes, I made him a suit, shirt and tie, a flag lapel pin. 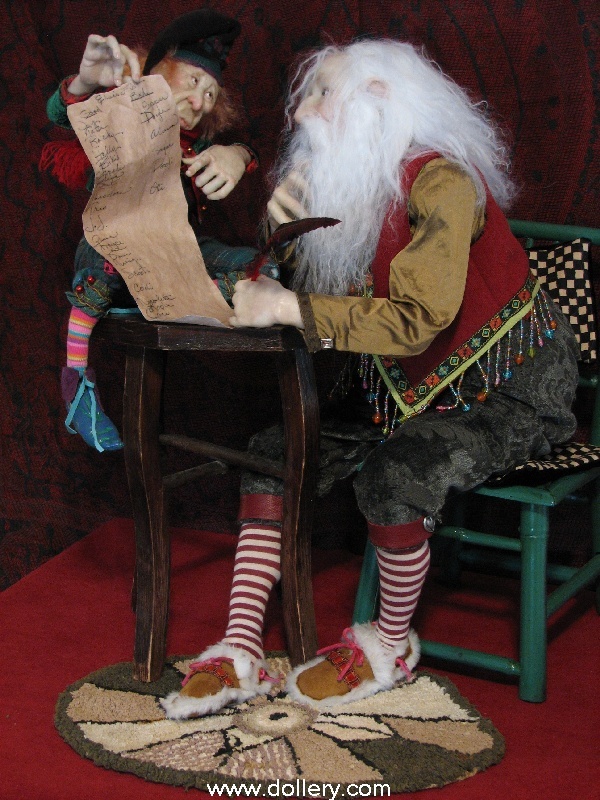 Santa is in the middle of checking his "Good and Bad Helpers, the Elve's list, when along comes the little elf "Oli", who feels he is definitely on the wrong list! 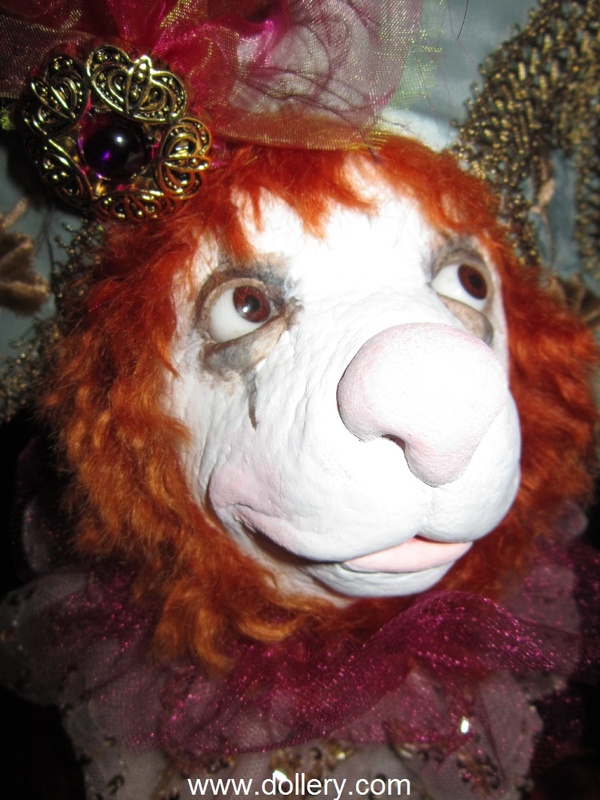 Both pieces are One of a kind, cernit, have glass eyes and Tibetan lamb hand made wigs. This piece about 21"X18". Their clothing is vintage silk, velvet, and also leather, beads and old buttons. The furniture is include. The table is vintage, but the chair isn't. I painted it green and added the checkered and velvet cushions. One of a Kind, Cernit. Glass eyes, various types of hair. Between 12"-15" tall. She comes with a little card attached with a poem about her. 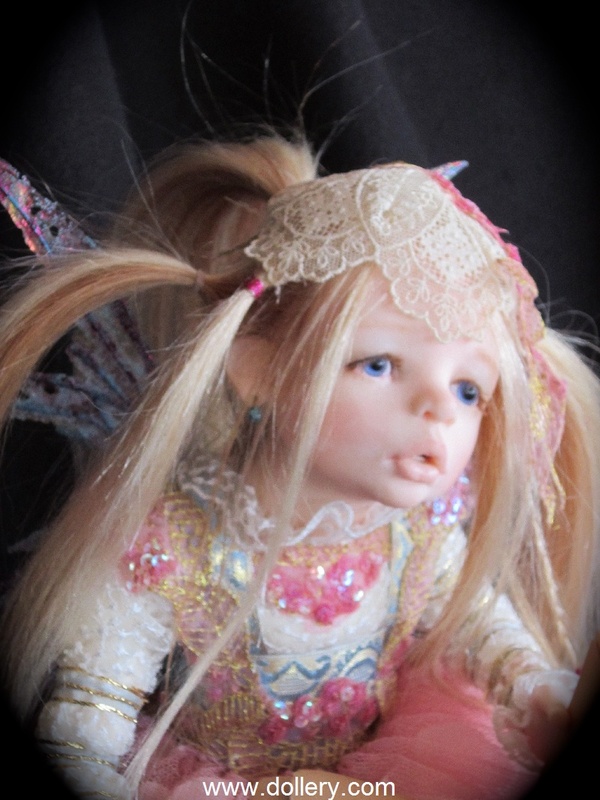 One of a Kind Cernit, 19", blue glass eyes, hair is hand dyed lambskin wig. Her outfit is made from vintage children's clothing. Her hand crafted shoes are made of red suede and buttons. Her hat is handmade. 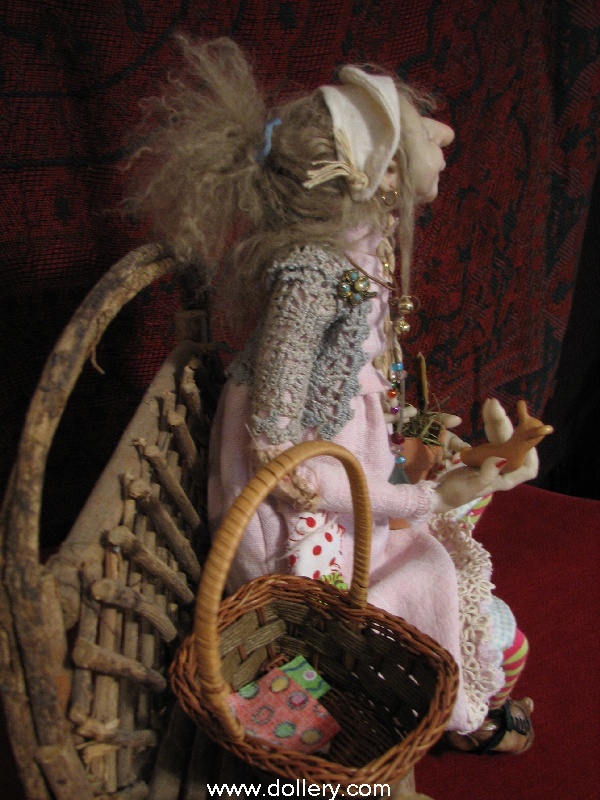 Emilie's dolly is vintage - very old. Please be aware that these are old prices. Ltd_25, Resin, 18" inches tall. Comes dressed in Levis and a white tea shirt and old flannel shirt. Each will be dressed slightly different. The sculpted Converse shoes can come in a variety of different colors. Just adorable! Ltd 25, Resin, 32 inches tall. Comes dressed in Antique baby gown. 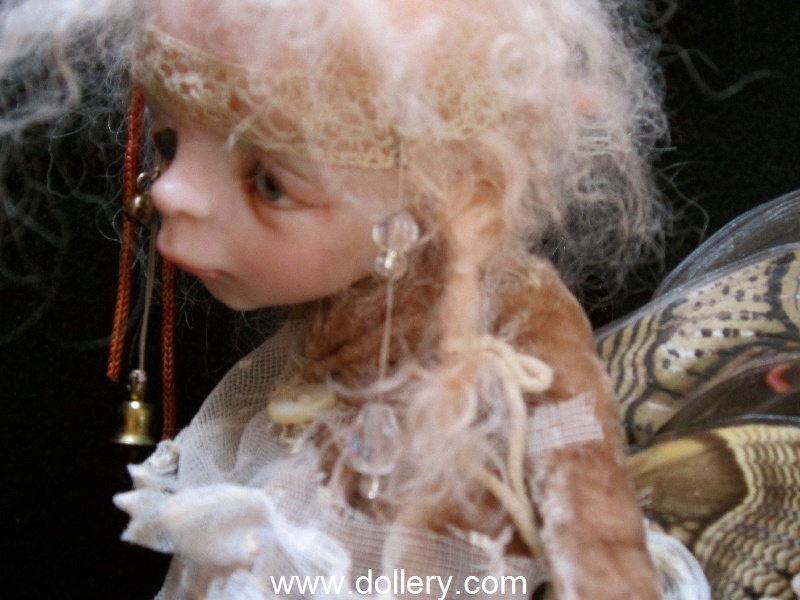 Each doll is in one of kind outfits made on antique vintage materials. Her baby doll is a handmade by Lulu as well. Dollery favorite. 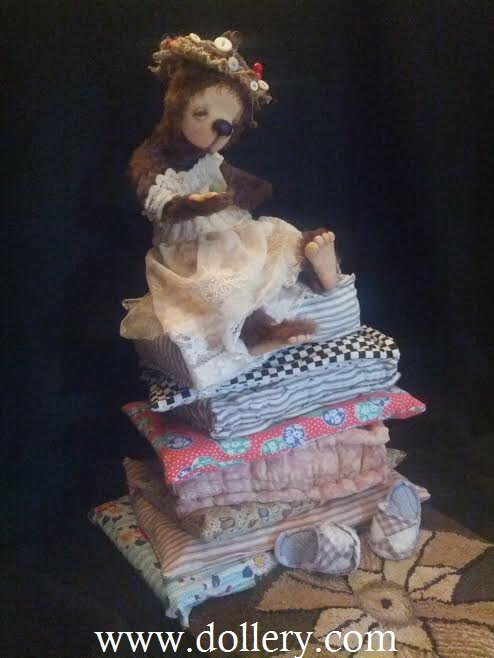 Resin, Free Standing, Ltd. 35 of 75 - One-of-a-kind outfit - Dollery favorite - Just adorable! 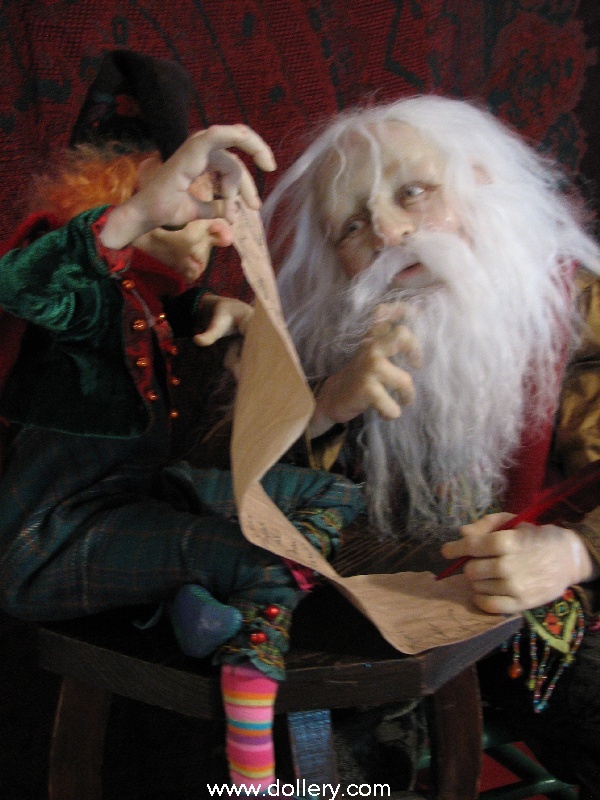 Notice - Lulu's prices have increased for 1999- Be sure to order your Lulu Doll now at these reasonable prices! We have Mandy in a different outfit. Resin - One-of-a-kind outfit . 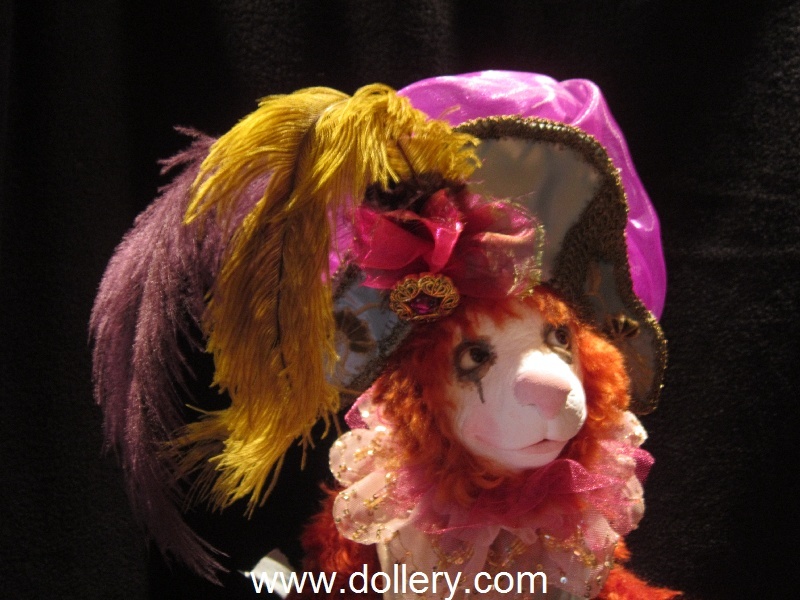 Notice - Lulu's prices have increased for 1999- Be sure to order your Lulu Doll now at these reasonable prices!- In one of a kind outfit. Large picture of Sweet Pea coming soon. She is in a off white outfit. Ltd. 10 - Hand Sculpted Leather. Very unusual. Wonderful job. Please be aware that these are old prices. 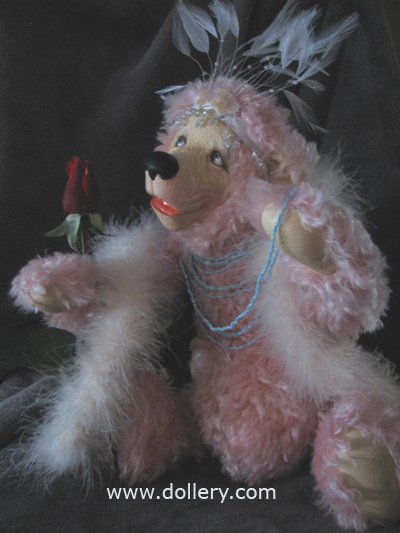 15"-17" bears are now priced at $800 - $900 depending on outfitting or accessories. 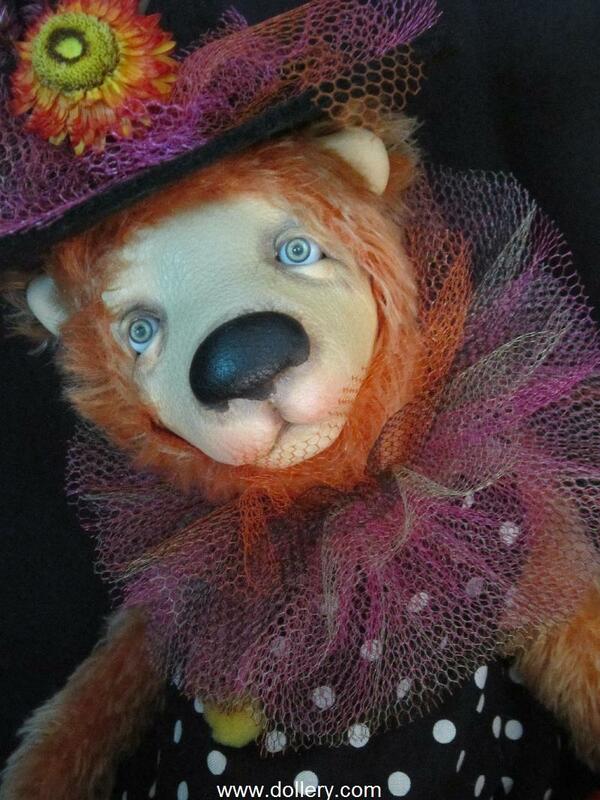 Larger bears like Jacques & Wilbur are $1000+. Call for exact pricing. 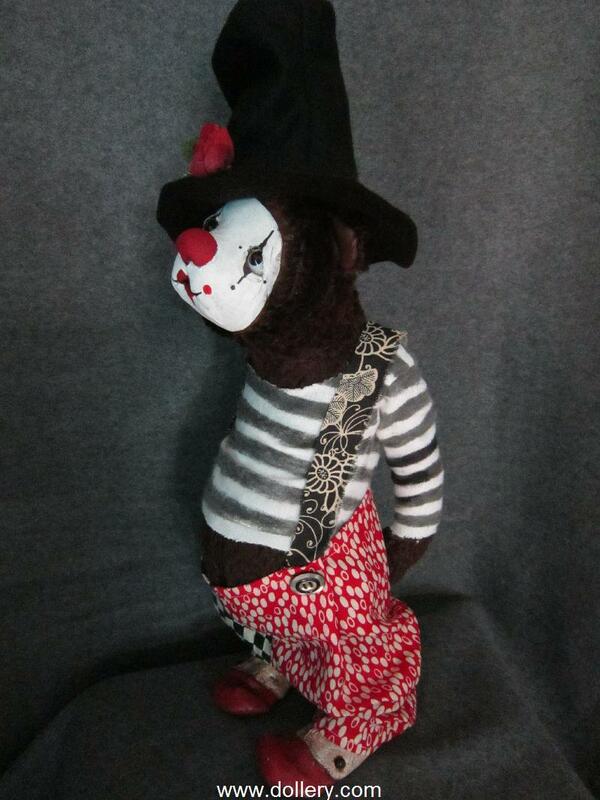 Ltd. 250, Leather face, black mohair. First year for limited edition bears. Similar bears can still be ordered. Ltd. 100, Leather face, Fleece Lined Coat. First year for limited edition bears. 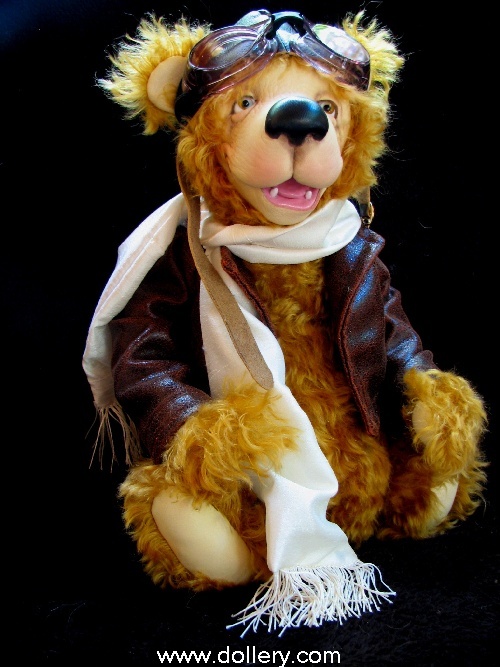 Wilbur is the lowest edition bear. Similar bears can still be ordered. Hand Sculpted Leather face. Not limited. Fall 1998 introduction. Just wonderful! Dollery favorite. Similar bears can still be ordered. Hand Sculpted Leather face. Not limited. Fall 1998 introduction. Just wonderful! Similar bears can still be ordered. Hand Sculpted Leather face. Not limited. Fall 1998 introduction. Cute. Similar bears can still be ordered. Hand sculpted leather face. Wonderful. Dollery favorite. Not limited. Similar bears can still be ordered. 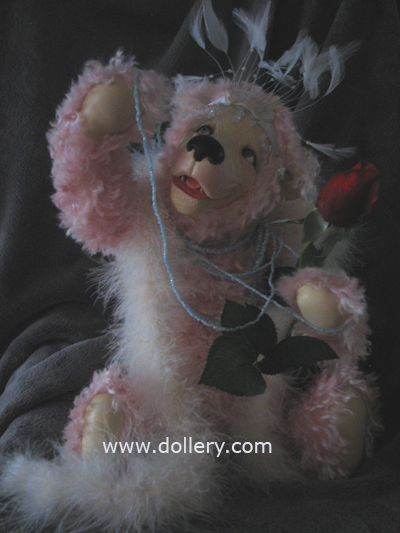 Call or e-mail kmalone@dollery.com! Hand sculpted leather face. Adorable. Not limited. Will be the next bear to retire along with Emmet not featured here. Available to order now. 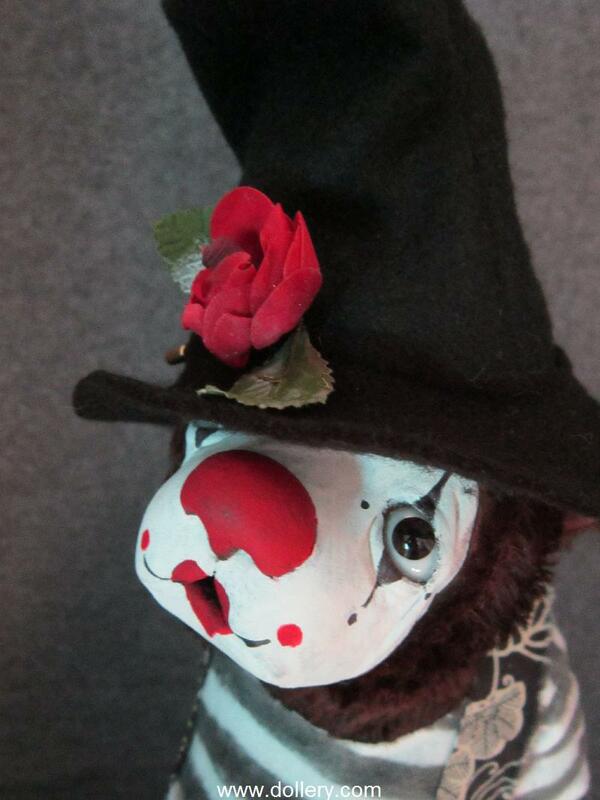 Hand sculpted leather face. Not limited. Fall 1998 introduction. Available to order now.